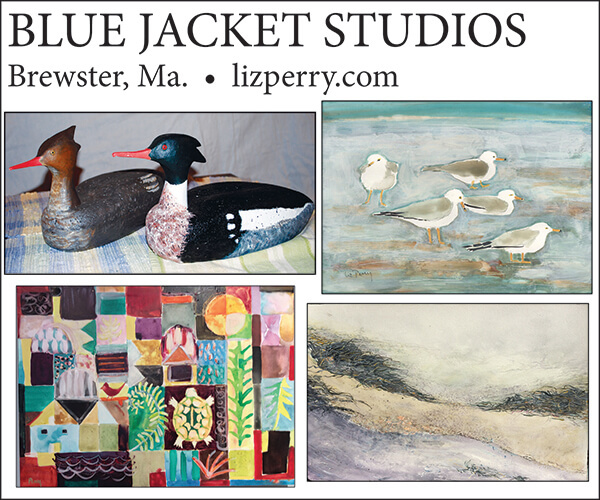 Blue Jacket Studio is in Brewster, MA, on the north side of 6A, and is a year-round painting and printmaking studio for Cape artist Liz Perry. Perry attended the College of Ceramic Art & Design at Alfred University, graduating with a BFA in painting and printmaking. She studied abstract painting and multiple printmaking techniques, especially stone lithography and zinc plate etching with printmaker John Wood, and painter/video artist Harland Snodgrass. She has also studied with printmaker Jon Hall at Haystack School of Crafts. 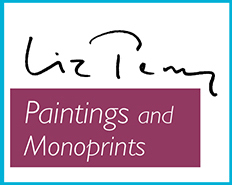 Over the years, Liz has taught drawing and printmaking, and given many printmaking demos at Cape Cod schools, art centers and community events. She has taught family drawing and nature drawing classes at The Audubon Center in Wellfleet and The Museum of Natural History in Brewster, and also worked for many programs designed to introduce children and young adults to printmaking on the Cape. She is currently working with the “Rise and Shine” arts program for the Cultural Center of Cape Cod. Ms. Perry has been creating and exhibiting her work for the past 40 years, receiving numerous awards for her monoprints, mixed media, and abstract paintings. She is a member and director on the Board of the Printmakers of Cape Cod. Blue Jacket Studio and her small summer gallery are located behind the historic Dillingham House in West Brewster. Blue Jacket Studio is named after her husband’s seafaring ancestor’s famous ship, The Blue Jacket, which was skippered by James Dillingham.